The Hawthorne team is always excited to celebrate new beginnings and long-awaited milestones with clients! On Saturday, October 14, we joined our clients, Metropolitan Pier and Exposition Authority, along with DePaul University and Wintrust Bank, for a ribbon cutting ceremony at the all new, state-of-the-art Wintrust Arena on McCormick Square’s campus. The ceremony kicked off the start of an exciting season of basketball, meetings, entertainment and more. As part of the annual Open House Chicago, Wintrust Arena welcomed neighbors, city officials and sports aficionados for a behind-the-scenes look at the city’s newest sports and entertainment arena. Complete with basketball scrimmages, private tours and a taste of the arena’s concessions, visitors were offered a behind-the-scenes experience like no other. Lori Healey, CEO, Metropolitan Pier and Exposition Authority, Ed Wehmer, Founder, Wintrust Financial Corporation, Dr. A Gabriel Esteban, President, DePaul University and Jeanne Ponsetto, Athletic Director, DePaul University, spoke to celebrate an exciting day of new beginnings – culminating in a picture-perfect ribbon cutting on the shiny new basketball court. As the new home to the DePaul men’s and women’s basketball teams and the WNBA Chicago Sky, the arena will host all home games, in addition to concerts and other entertainment. First up on October 27th: Bob Dylan! With such positive feedback from Open House Chicago attendees, we can’t wait to see what the future holds for Wintrust Arena. The weekend was chocked full of announcements and celebration! 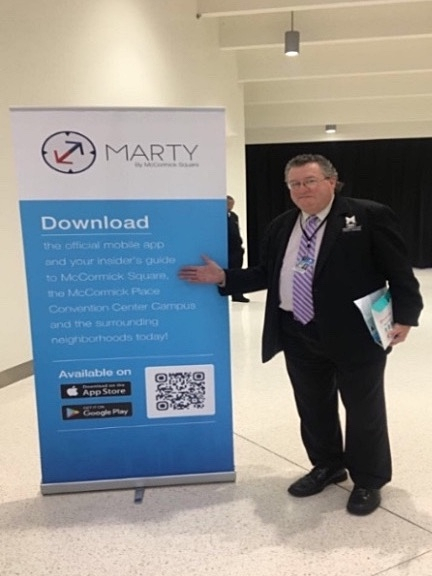 In addition to unveiling the brand new Wintrust Arena to our Chicago neighbors, we also filled them in on one of the newest, most handy smart phone apps on the market: MARTY by McCormick Square. 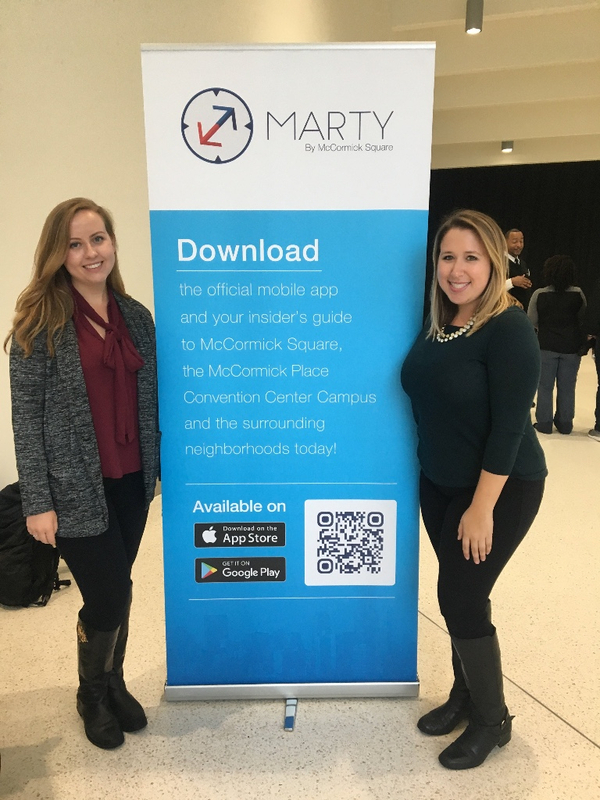 Complete with dining options, navigation features, and much more, MARTY is the insider’s guide to all things McCormick Square. It even gives visitors a unique opportunity to seamlessly view all of the breathtaking public art that’s on display on campus. From the on campus art galleries to restaurants, bars, retail and more in the surrounding neighborhoods, the app gives users the chance to navigate through all that McCormick Square has to offer. Download it today on the Apple Store and Google Play! 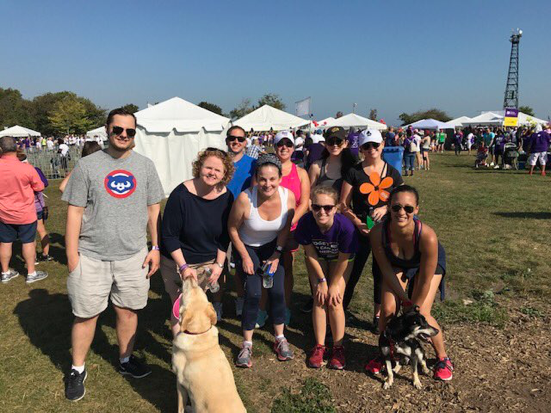 On August 24, the Hawthorne team ventured to Uptown to join the 2017 Chicago Walk to End Alzheimer’s, which kicked off at Montrose Harbor. Team member, Britt Logan, is a recruitment chair for the Chicago chapter, and encouraged our team to raise $1,000 for the cause. However, the Hawthorne team didn’t stop there. With generous donations from family, friends and colleagues, we exceeded our goal and raised $1,065! The Hawthorne team was ready to kick off the morning at 9 a.m. sharp, and we slowly but surely made our way through the 5k trail alongside thousands of advocates. Surrounded by those who have been affected by the disease, those who have watched others suffer and those who are fighting to support a cure, we were grateful to take part in such an eye-opening experience. Hearing those different accounts of how Alzheimer’s has impacted families has certainly encouraged us to continue our involvement in this great cause, and we are looking forward to next year’s walk. Hopefully we’ll see you there. Go team, go! Conversation is key! Recently, we hosted a panel discussion to continue our In Good Company series, tackling a hot button issue: how do different generations work together successfully? “Generation Showdown: Working Together at Any Age,” featured Ken Meyer from the Department of Business Affairs and Consumer Protection (Baby Boomer), Claire Koeneman, formerly of Hill + Knowlton Strategies (Gen X) and Erin Sullivan from World Business Chicago (Millennial), each armed and ready to discuss their generational habits. The three panelists shared their views on how individuals of different generations can coexist in the workplace and all work towards one shared goal. The most common piece of advice from our panelists was to understand everyone’s various backgrounds, experiences and circumstances. When you take the time to listen, you gain a deeper understanding of the individual, and might find that you have similarities in history, work ethic and more. Below you can check out some of our favorite comments from our panelists from our live-tweeting session!